As the traffic volume has increased, so has the likelihood of vehicular-related injuries or vehicle collisions. In residential areas, traffic flow peaks during common times of travel - mornings, when families drive to work or school, after-school pick up hours, and the rush hour after most 9-5 facilities close. Sometimes the density of traffic is so great that manual monitoring of speed compliance becomes challenging. In 1983, the first use of speed humps were approved for use in the United States in order to motivate vehicles to drive less than 30 miles per hour in designated areas. Because they act to regulate speed passively, they are sometimes referred to as "sleeping policemen." What is a Speed Bump? A speed bump is a small raised area in a road, typically 3-4 inches in height and 1-3 feet in length. They are designed to compel vehicles to slow their speed to 15-20 miles an hour in order to cross without discomfort to the driver or damage to the vehicle. In residential areas, speed humps are often installed, which are similar in height to speed bumps but quite a bit longer. Speed bumps have been shown to reduce the frequency of several factors associated with collisions. A study by the Portland Bureau of Transportation found that annual crash frequency decreased by 39% on streets that had been treated with speed bumps. Moreover, the number of injuries sustained in the crashes on treated streets were reduced by 46%, making any crashes that did occur less severe than they may otherwise have been. One of the greatest benefits of installing speed bumps in residential areas is the increased safety it provides to pedestrians. According to the American Journal of Public Health, children are especially susceptible, with automobile collisions responsible for the greatest number of deaths of American children aged 5-14. It was found that installing a speed bump is associated with a 53%-60% reduction in injury or death in neighborhood children struck by a vehicle. Because the most severe injuries are often related to vehicles exceeding the speed limit, installation of speed bumps helps to ensure that drivers abide by the posted speeds. 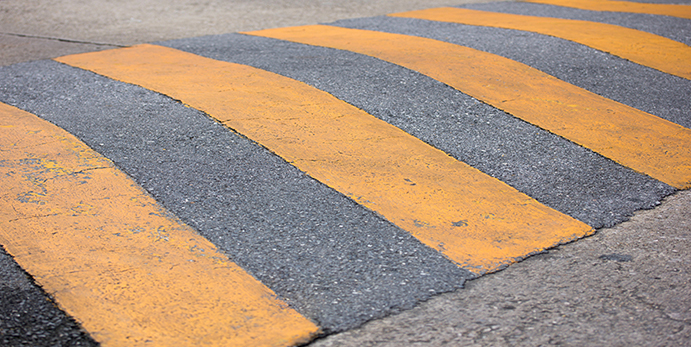 Whether speed bumps can be installed locally is determined by policies that vary statewide. Typically, there are a series of measures that must be met for a street to be approved: a minimum traffic volume, such as 500 vehicles, must pass on the street per day, and the majority of vehicles must be traveling at a certain speed bracket, such at 85% traveling at or below 35 miles per hour. These measures ensure that speed bumps will be installed in relatively high-volume areas that require moderately slow speeds. If a street in a local neighborhood meets the city's requirements but does not currently have a speed bump installed, a citizen can contact the local traffic division with a request to review the street. The city must ensure that the street is not on a primary route for emergency responders, such as the Fire Department, and then the request must be signed by a number of other residents. The street is then subjected to data analysis to ensure that the city's volume and speed measures are met. If the street falls within the required parameters, installation is likely to be approved. Speed bumps are an effective way to reduce frequency and severity of collisions, improve pedestrian safety, and passively reduce the number of vehicles exceeding the recommended speed limits. In areas with fairly high traffic and especially in residential settings where children are likely to play, the installation of speed bumps can dramatically improve the safety of pedestrians and motorists alike.